‘Alright’ I said, ‘I’ll try…’ This is how Emily Stuart opens her intricate tale of a classic love affair that becomes Caroline’s Bikini: a swirling cocktail of infatuation, obsession, and imagination.The moment that Emily’s friend Evan Gordonstone – a successful middle-aged financier – meets Caroline Beresford – a glamorous former horsewoman, and now housewife, hostess, and landlady – there is a ‘PING!’ At least, that’s how Evan describes it to Emily when he persuades her to record his story: the story of falling into unrequited love, which is as old as Western literature itself. Thus begins a hypnotic series of conversations set against the beguiling backdrop of West London’s bars, fuelled in intensity by endless G&Ts and Q&As. 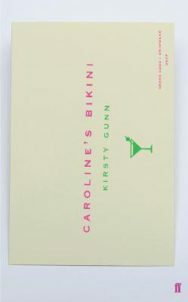 From the depths of mid-winter to July’s hot swelter, Emily’s narration of Evan’s passion for Caroline will take him to the brink of his own destruction.Written in a voice so playful, so charismatic, and so thoughtfully aware of the responsibilities of fiction it can only be by Kirsty Gunn, Caroline’s Bikini is a swooning portrait of courtly love – in a modern world not celebrated for its restraint and abstraction. Ready. Steady. Go! Kirsty Gunn is an internationally awarded writer who published her first novel with Faber in 1994 and since then eight works of fiction, including short stories, as well as a collection of fragments and meditations, and essays. She is Professor of Writing Practice and Study at the University of Dundee and lives in London and Scotland with her husband and two daughters.